This has really been a doosey! Thanks, Mr. Roberts. :) The symptoms of this issue is that all the usb ports on the Windows 10 computer do not work which prevent using the keyboard and mouse from working and logging into the computer. The keyboard and mouse do work, however, before Windows loads (ie BIOS settings screen). 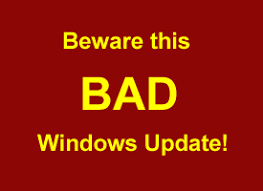 The root cause of the problem is a recent Windows update (KB4074588). This was published mid-February 2018 and I'll focus the steps below for this specific problem. I'll cut out many of the troubleshooting steps I did and give you a targeted solution to speed up your recovery for this specific issue. I'll list the easy things to try first that may work then progress to other solutions. The ultimate goal for this problem is to remove KB4074588 and prevent it from re-installing by whatever means you can muster. That's about all the easy things to try that may actually work. Now on to the the solution that worked for me. To perform these steps you need to get your pc to the Windows Command prompt in the diagnostic mode either using a boot disk or turning your pc on and off (push power button when the Windows logo is displayed) 3-4 times. That will launch the built-in diagnostic screen. Follow the on-screen menus to eventually get to the Command Prompt. The package will be uninstalled. It may state that an error has occurred and no changes were made but most likely it has been removed. You will likely be able to login to Windows now but you're NOT DONE yet. Go ahead and log in and do the victory dance! It's down hill from here. Once you're in, go immediately to Windows Update and remove KB4074588 via the normal uninstall process. Once that is remove you may need to restart. Almost done. After restarting, follow the instructions at https://support.microsoft.com/en-us/help/3073930/how-to-temporarily-prevent-a-driver-update-from-reinstalling-in-window to prevent KB4074588 from automatically reinstalling. If none of these methods worked for you the last resort is to restore your pc to factory defaults which could result in loss of data if you don't have backups or can't backup the data beforehand.